Billionaire Putera Sampoerna donated $150 million as an endowment fund to his family’s Putera Sampoerna Foundation when it was started in 2001. Since then it has disbursed $56 million as scholarships to the 34,600 students, some of them in elementary school and others in college, some of them even able to study abroad. In 2009, the foundation launched the Sampoerna Academy, a free boarding school that combined an international curriculum with the national curriculum, designed to create future leaders. The foundation has built two such Sampoerna Academies in Palembang and Malang with support from local governments and donors. The aim is to have one academy in every province within the next 10 years. Next up is a plan to build a university. Putera, with an estimated $2.5 billion net worth, first proposed the idea for an education foundation in some articles he wrote in 1984, followed by research in early 1990. To run the organization, he has enlisted his family, including his wife and four children, with his daughter Michelle as the chairman. Today, aside from Sampoerna, the foundation is supported by 170 companies—mostly multinationals—and 1.2 million individuals. Putera’s vision is to produce Indonesia’s future leaders, instilled with both ethics and education. 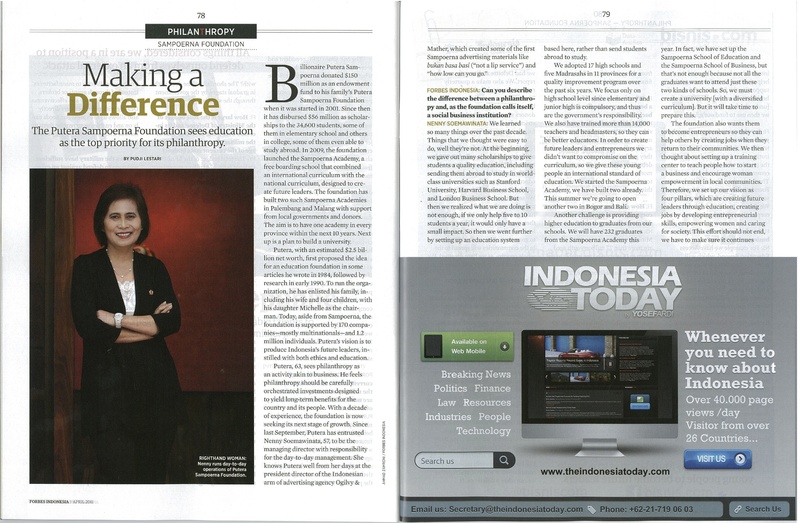 FORBES INDONESIA: Can you describe the difference between a philanthropy and, as the foundation calls itself, a social business institution? NENNY SOEMAWINATA: We learned so many things over the past decade. Things that we thought were easy to do, well they’re not. At the beginning, we gave out many scholarships to give students a quality education, including sending them abroad to study in world-class universities such as Stanford University, Harvard Business School, and London Business School. But then we realized what we are doing is not enough, if we only help five to 10 students a year, it would only have a small impact. So then we went further by setting up an education system based here, rather than send students abroad to study. We adopted 17 high schools and five Madrasahs in 11 provinces for a quality improvement program over the past six years. We focus only on high school level since elementary and junior high is compulsory, and thus are the government’s responsibility. We also have trained more than 14,000 teachers and headmasters, so they can be better educators. In order to create future leaders and entrepreneurs we didn’t want to compromise on the curriculum, so we give these young people an international standard of education. We started the Sampoerna Academy, we have built two already. This summer we’re going to open another two in Bogor and Bali. Another challenge is providing higher education to graduates from our schools. We will have 232 graduates from the Sampoerna Academy this year. In fact, we have set up the Sampoerna School of Education and the Sampoerna School of Business, but that’s not enough because not all the graduates want to attend just these two kinds of schools. So, we must create a university [with a diversified curriculum]. But it will take time to prepare this. The foundation also wants them to become entrepreneurs so they can help others by creating jobs when they return to their communities. We then thought about setting up a training center to teach people how to start a business and encourage woman empowerment in local communities. Therefore, we set up our vision as four pillars, which are creating future leaders through education, creating jobs by developing entrepreneurial skills, empowering women and caring for society. This effort should not end, we have to make sure it continues into another decade. We need the help of others. One of the ways is by supporting the foundation’s financial health. 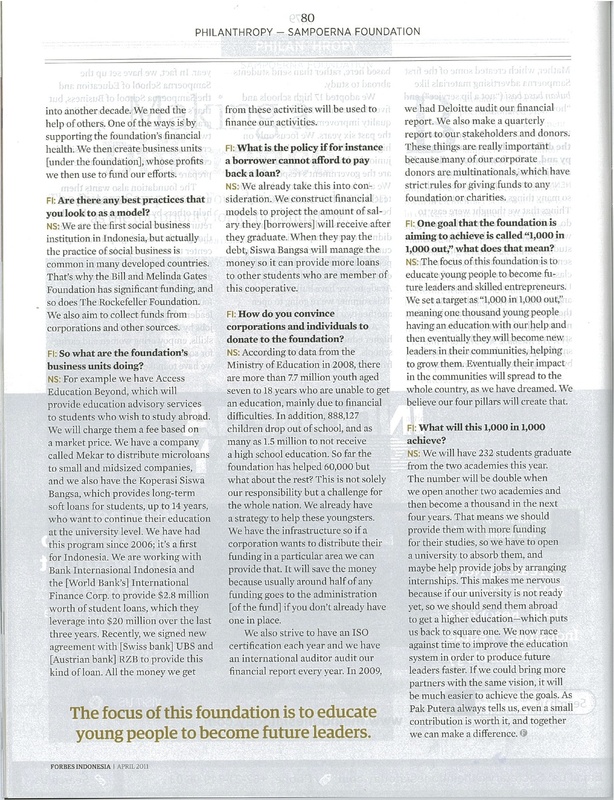 We then create business units [under the foundation], whose profits we then use to fund our efforts. FI: Are there any best practices that you look to as a model? NS: We are the first social business institution in Indonesia, but actually the practice of social business is common in many developed countries. That’s why the Bill and Melinda Gates Foundation has significant funding, and so does The Rockefeller Foundation. We also aim to collect funds from corporations and other sources. FI: So what are the foundation’s business units doing? NS: For example we have Access Education Beyond, which will provide education advisory services to students who wish to study abroad. We will charge them a fee based on a market price. We have a company called Mekar to distribute microloans to small and midsized companies, and we also have the Koperasi Siswa Bangsa, which provides long-term soft loans for students, up to 14 years, who want to continue their education at the university level. We have had this program since 2006; it’s a first for Indonesia. We are working with Bank Internasional Indonesia and the [World Bank’s] International Finance Corp. to provide $2.8 million worth of student loans, which they leverage into $20 million over the last three years. Recently, we signed new agreement with [Swiss bank] UBS and [Austrian bank] RZB to provide this kind of loan. All the money we get from these activities will be used to finance our activities. FI: What is the policy if for instance a borrower cannot afford to pay back a loan? NS: We already take this into consideration. We construct financial models to project the amount of salary they [borrowers] will receive after they graduate. When they pay the debt, Siswa Bangsa will manage the money so it can provide more loans to other students who are member of this cooperative. FI: How do you convince corporations and individuals to donate to the foundation? NS: According to data from the Ministry of Education in 2008, there are more than 7.7 million youth aged seven to 18 years who are unable to get an education, mainly due to financial difficulties. In addition, 888,127 children drop out of school, and as many as 1.5 million to not receive a high school education. So far the foundation has helped 60,000 but what about the rest? This is not solely our responsibility but a challenge for the whole nation. We already have a strategy to help these youngsters. We have the infrastructure so if a corporation wants to distribute their funding in a particular area we can provide that. It will save the money because usually around half of any funding goes to the administration [of the fund] if you don’t already have one in place. We also strive to have an ISO certification each year and we have an international auditor audit our financial report every year. In 2009, we had Deloitte audit our financial report. We also make a quarterly report to our stakeholders and donors. These things are really important because many of our corporate donors are multinationals, which have strict rules for giving funds to any foundation or charities. FI: One goal that the foundation is aiming to achieve is called “1,000 in 1,000 out,” what does that mean? NS: The focus of this foundation is to educate young people to become future leaders and skilled entrepreneurs. We set a target as “1,000 in 1,000 out,” meaning one thousand young people having an education with our help and then eventually they will become new leaders in their communities, helping to grow them. Eventually their impact in the communities will spread to the whole country, as we have dreamed. We believe our four pillars will create that. FI: What will this 1,000 in 1,000 achieve? NS: We will have 232 students graduate from the two academies this year. The number will be double when we open another two academies and then become a thousand in the next four years. That means we should provide them with more funding for their studies, so we have to open a university to absorb them, and maybe help provide jobs by arranging internships. This makes me nervous because if our university is not ready yet, so we should send them abroad to get a higher education—which puts us back to square one. We now race against time to improve the education system in order to produce future leaders faster. If we could bring more partners with the same vision, it will be much easier to achieve the goals. As Pak Putera always tells us, even a small contribution is worth it, and together we can make a difference. 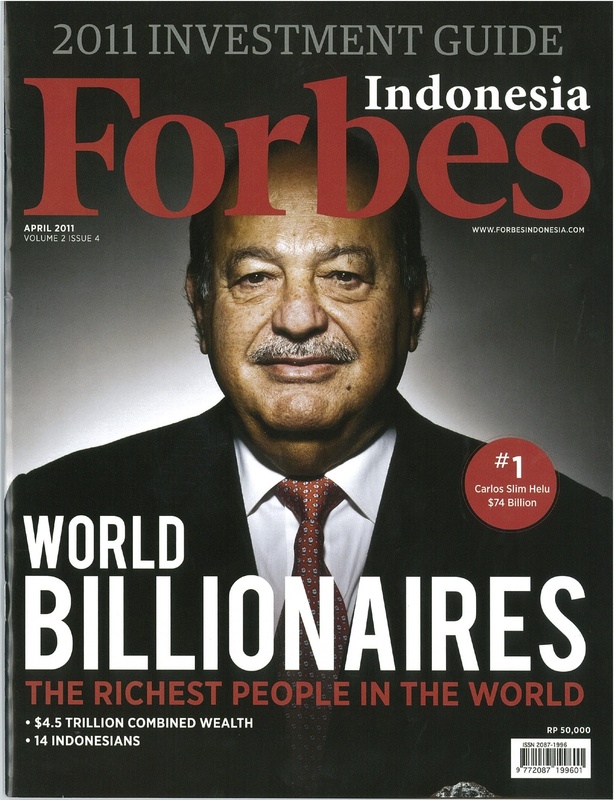 * This story appears in April 2011 issue of Forbes Indonesia magazine. 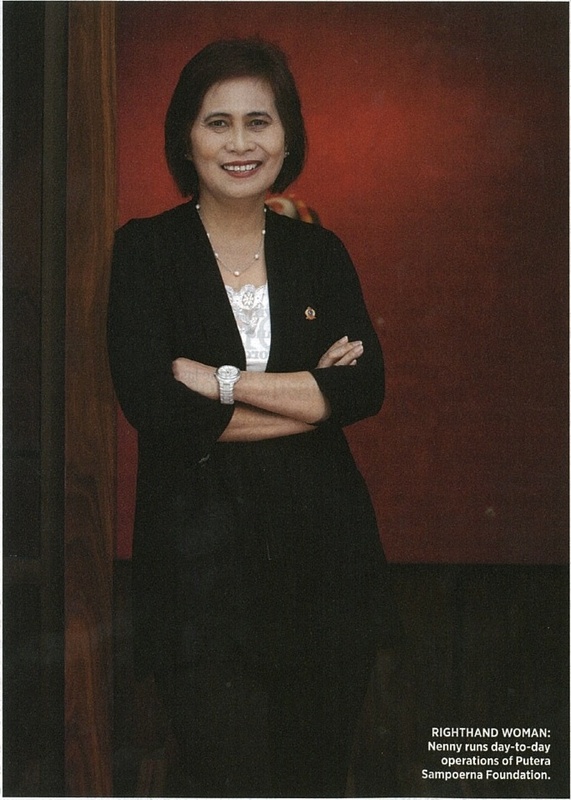 This entry was posted in Companies, People and tagged Michelle Sampoerna, Nenny Soemawinata, philanthropy, Putera Sampoerna, Putera Sampoerna Foundation, Sampoerna Academics by Pudji Lestari. Bookmark the permalink.